RoyalEnfields.com: Want to trade your Royal Enfield Bullet for his Triumph? Want to trade your Royal Enfield Bullet for his Triumph? 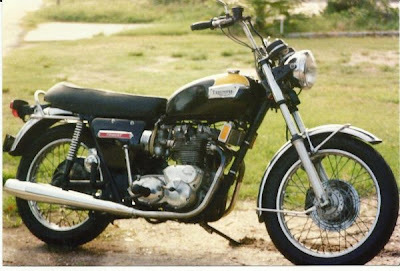 The Triumph Trident three-cylinder motorcycle was fast and controversial. Time for something completely different? The owner of a 1974 Triumph Trident is offering to trade it for a Royal Enfield Bullet. His ad on CraigsList in Corpus Christi, Texas, says that he wants a Royal Enfield for his wife to ride. "She wants to start riding, so I thought I would try a trade." The bike is not for sale otherwise, he writes. The Trident is certainly interesting. A three-cylinder in-line, four-cycle, 740cc motor made it in the eyes of some the first "super bike" when introduced in the summer of 1968. It was soon overshadowed by the Honda CB750 four, however. The Honda came with overhead camshaft and an oil-tight engine. The Trident couldn't initially match the Honda's five-speed gearbox, electric start, left-side shift and front disk brake. The Triumph was fast: probably 120 mph. The collapse of the British motorcycle industry was proceeding just as quickly and production of the Triumph and similar BSA Rocket Three trailed off with only 27,480 built. Ad already deleted. That was fast. He CAN'T have meant for an Indian Bullet, not a Redditch, can he? Really?